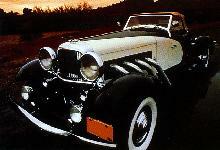 Friedrich Samuel (1876-1932) and August (1980-1955) Duesenberg were born in Germany but grew up in America. They built bicycles, motorcycles and in 1904 even a racing car. The Mason was powered by a two cylinder boxer engine. Unfortunately, the company was forced to close down soon afterwards. The Duesenbergs continued alone. During the First World War, the company produced 400 Bugatti aircraft engines under licence for the US Air Force and in 1920 the first passenger car emerged from the Indianapolis factory. The most marvellous designs were produced. The collapse of Errett Cord's empire in 1937 also meant curtains for the Duesenberg Corporation. In total, 480 cars were sold under this brand name. They were tailor-made for film stars such as Gary Cooper, Mae West and Clark Gable. 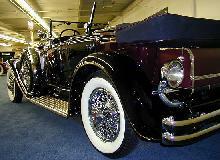 At the time, Duesnberg was the most expensive, but certainly most special, make of car in America.